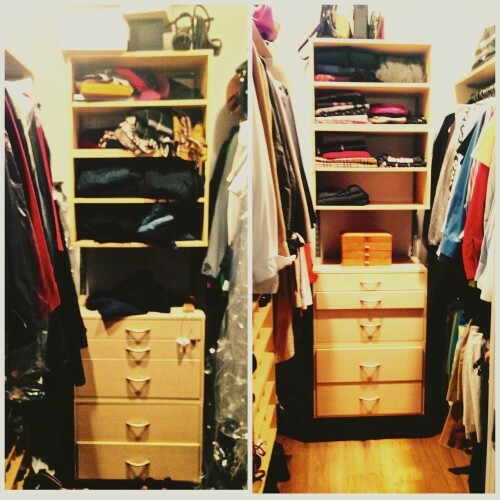 Switch Out the Closet and Make Some Room! Leaves are falling, a chill is in the air. Fall is a time to slow down, get organized and prepare for the cooler months ahead. 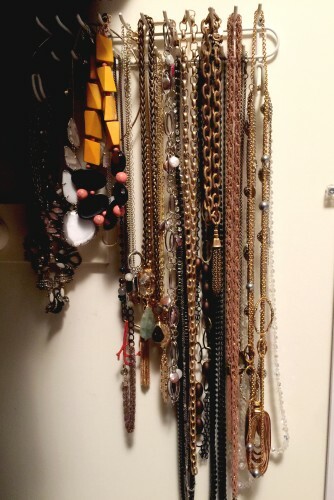 It’s time to bring back the AskSuzanneBell Closet Cleanout Post, and make some room! Raining outside? Take advantage of that forced indoor time, and jump into the closet…you’ll be happy you did! Need some inspiration? Perhaps these beauties, will get you in the mood! Twice a year, I “gut” my closet, and give it a little facelift. 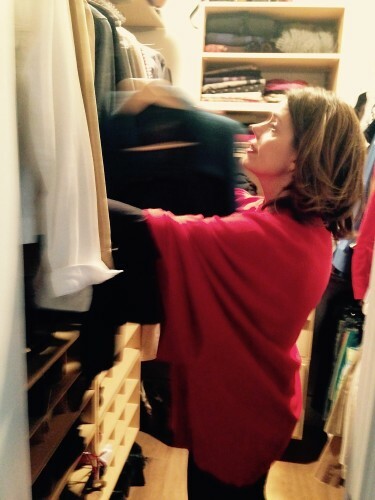 I do this by removing EVERYTHING out of my closet, bring my seasonal clothing out of storage, and reset. 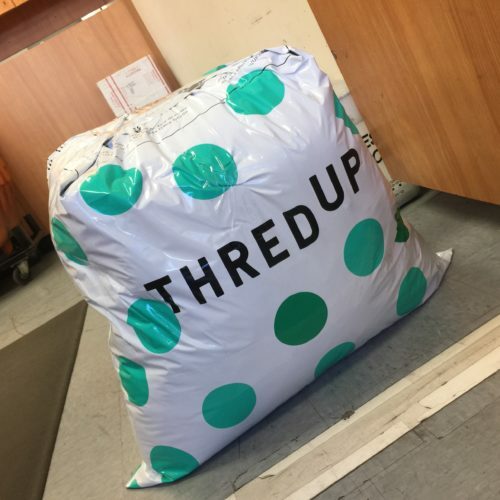 I inspect every item that goes back in, pack up off-season clothing and donate or resell what is no longer working for me. This process can be overwhelming, so planning is key. I pick a date on the calendar when I have a few hours free. I know I need about 4 uninterrupted hours to accomplish what needs to get done in my closet. On my date of choice, I set aside the time, turn off my phone and focus. I grab a cup of coffee, and start working. #1 Make some room. Remove EVERYTHING from your closet. #2 Sort into 5 piles: keep, store, donate, resell and garbage. #3 Closet re-entry, evaluate each piece, keep only what you love. Organize by type of garment, then colorize. #4 Accessories where you can see them. Along with my uber-organized girlfriend, Amy, we helped our dear friend clean out her closet. 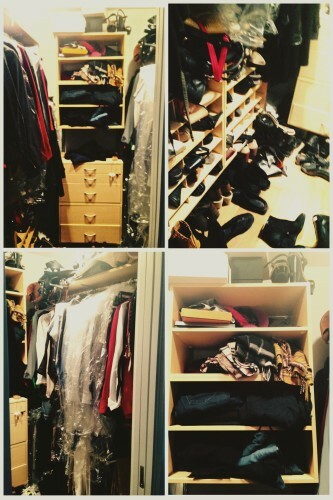 The photos used in this post, are from her actual closet. Remove all of the clothes from your closet. Yes, EVERYTHING! 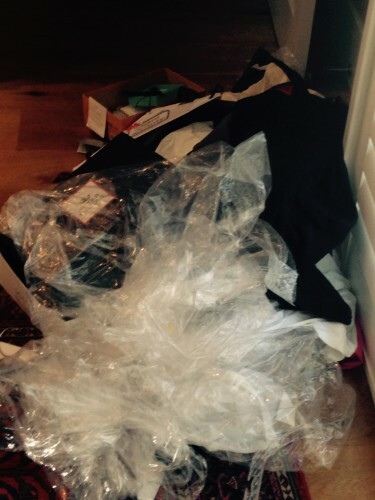 I place handbags, shoes and accessories, in separate piles on the floor. Vacuum out the closet. Toss any garbage, shoeboxes, bags and clutter. 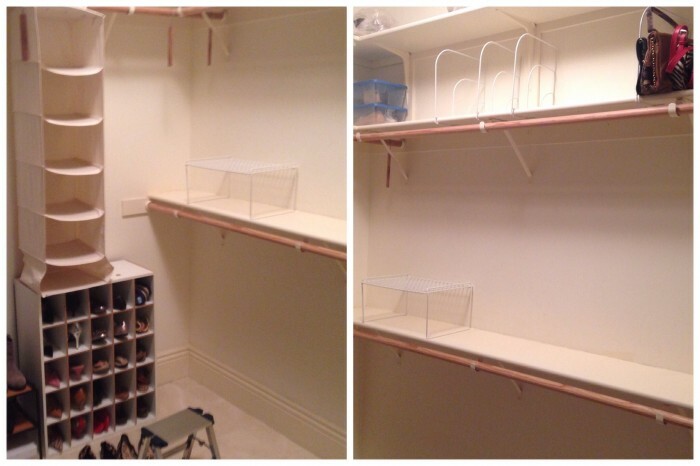 If you’ve stored any off-season items, unpack, and add them to the pile. 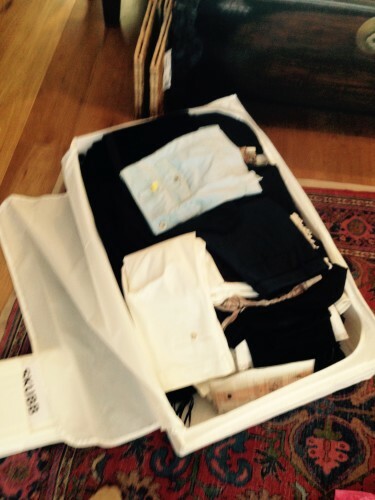 Using storage containers, pack up the off-season items by folding them into the totes. If its still dead of winter in your parts, keep your favorite winter pieces – and store the rest. Touch and inspect each item that is going into storage. Look for pilling, fading. Have you worn the piece at all this year? Now the hard part, deciding which clothes you will donate or resell. This is the hardest step, and the most important. 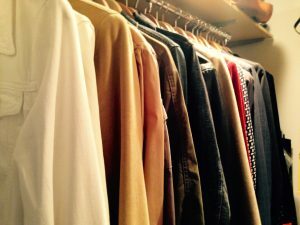 If you want to have a truly organized closet, then your goal should be to get rid of as many items of clothing as possible. 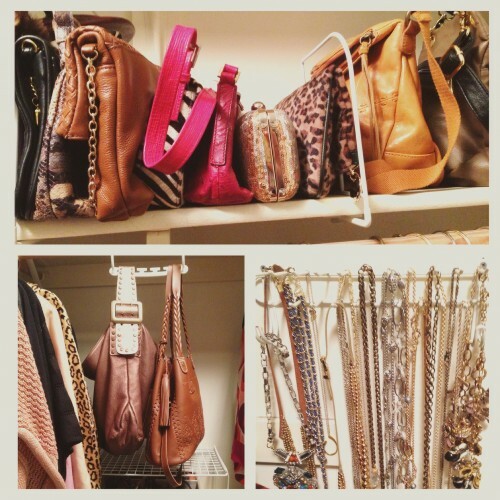 Keep all the clothes that you wear on a regular basis, and garments that you would miss if they weren’t in your closet. If you’ve worn a certain item in the last week, month, or even few months, you should hold on to it as long as it’s seasonally appropriate. Does it still fit? Stop waiting for the day that it will fit, and donate or consign it. Off season items, nicely folded and ready to be stored until next spring. Now it is time to put your clothes back in the closet. As you prepare your items for re-entry, evaluate each piece honestly. For each item you are unsure of, ask yourself the questions listed above. If you truly cannot make the call, set the item aside and ask a good friend to give you an honest opinion. It is possible that you are holding onto the item, for emotional reasons. 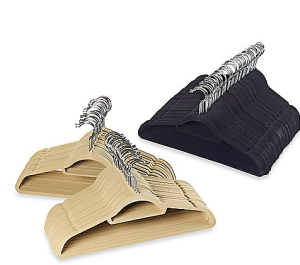 Hang up your clothes and organize them. 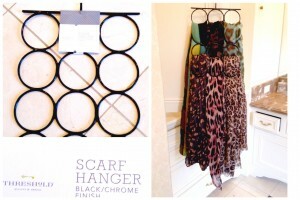 Try to hang up as many of your clothes as you can. 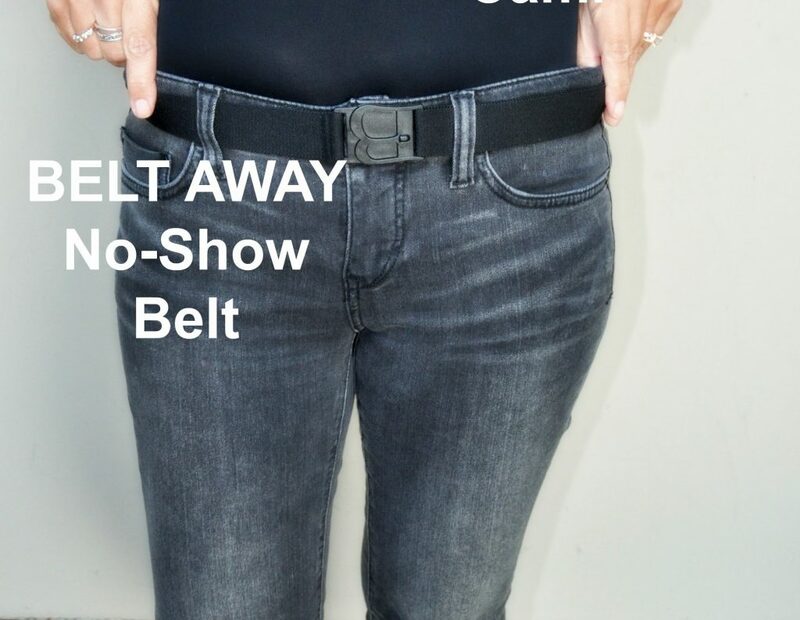 This will make it easier for you to find your clothes, and conserve space. I like to use thin felt type black hangers. You can get these at Costco, Bed, Bath & Beyond and Target. 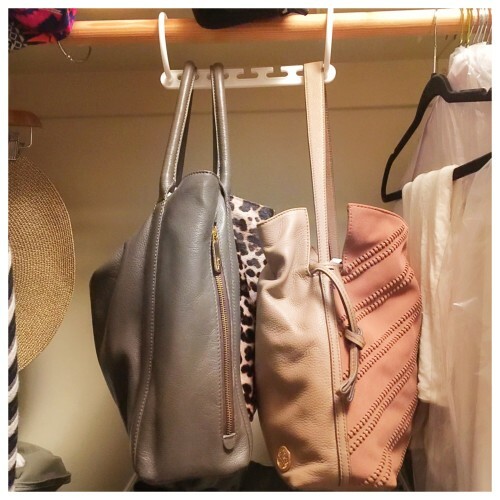 These hangers allow for more storage, and the items don’t slip off. Matching hangers make your closet look cleaner, and more orderly. The items I wear the most are in the best location for easy access and visibility, making it easy to get dressed in the morning. 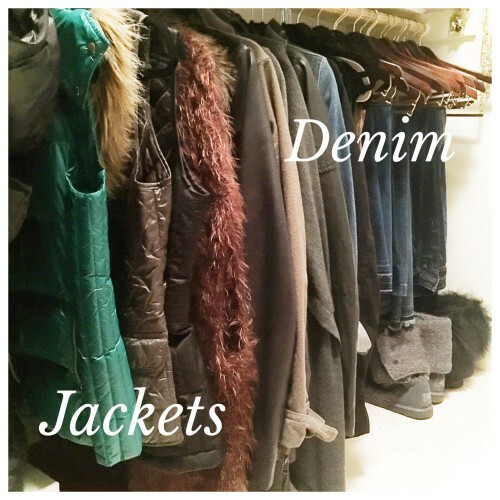 In my own closet, denim and jackets, are front and center. 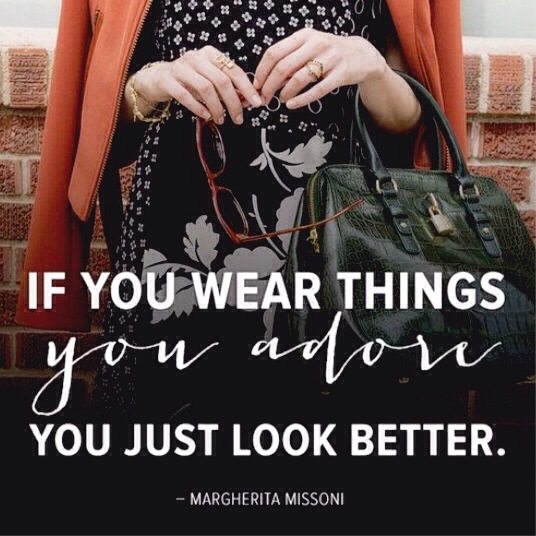 Accessories make an outfit, but if you can’t find them – then what’s the point? I use shelf dividers to make my clutches and handbags line up and stay put. Available at the Container Store. I have a little foldable foot stool in my closet to easily reach these higher items when I need them. 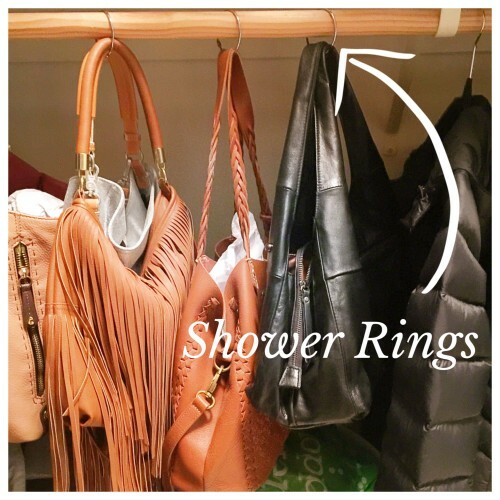 Shower hook rings work well for storing handbags as well. I find I wear my stuff when I can see it. 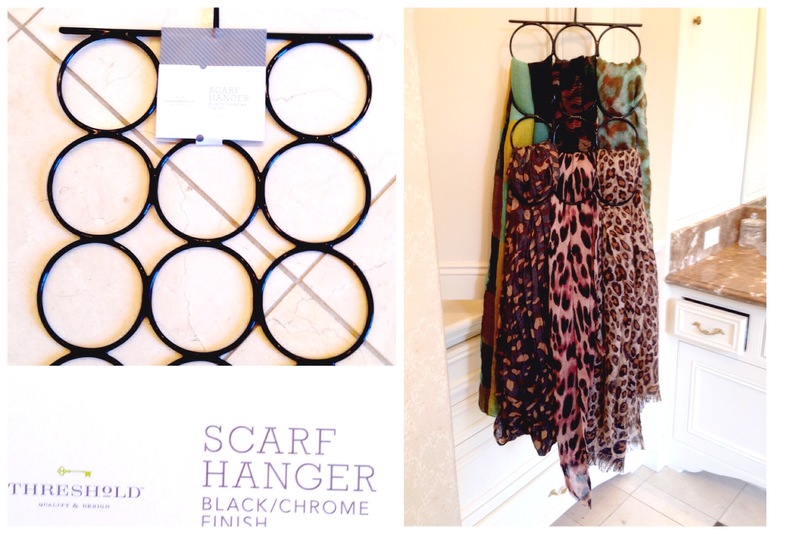 This scarf hanger allows me to see what I own at a glance for easy accessorizing! I like to see all my in season shoes. In the springtime, I store my boots in long plastic boxes that I get at Target. My pumps and flats fit into shoe dividers from Target. 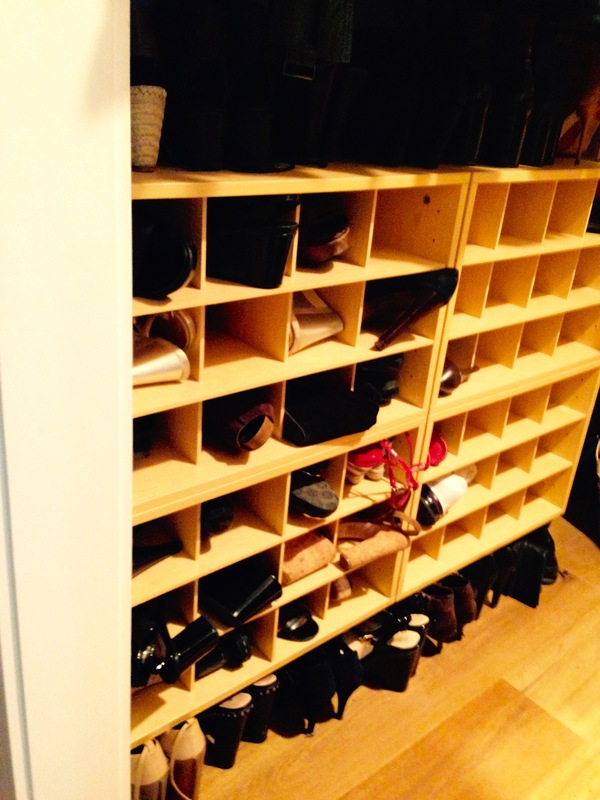 My party shoes are stored in clear shoe boxes, on an upper shelf in the event of a special occasion. I can still see them, but they are out of the way of daily use. What to do with those items that are still in great shape, that I don’t wear anymore? There are lots of options these days – the best option is a personal one, and depends how much time you want to put into the whole process. Consign at your local consignment shop. Make an apt, drop off your goods, and collect a commission when your items sell. 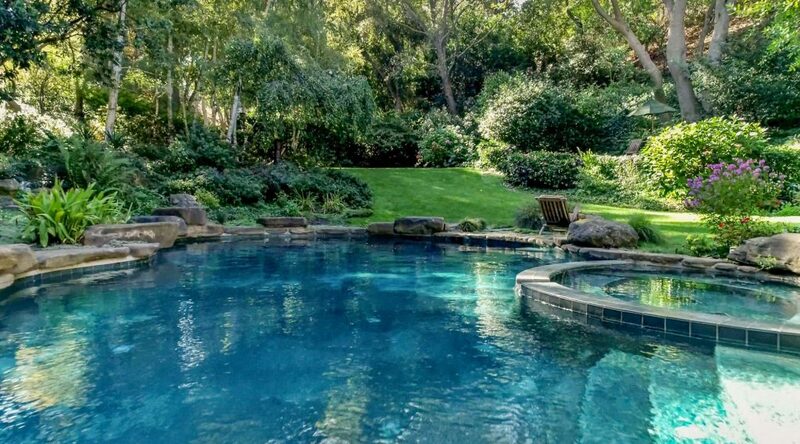 Two of my favorite consigners in the area are; Repeter in Los Altos,and Millie Mango in Burlingame. Fillmore&5th, is good as well. More work = More dollars to you. I like Poshmark. Super easy to use (way easier than Ebay), due to their super user friendly user App. 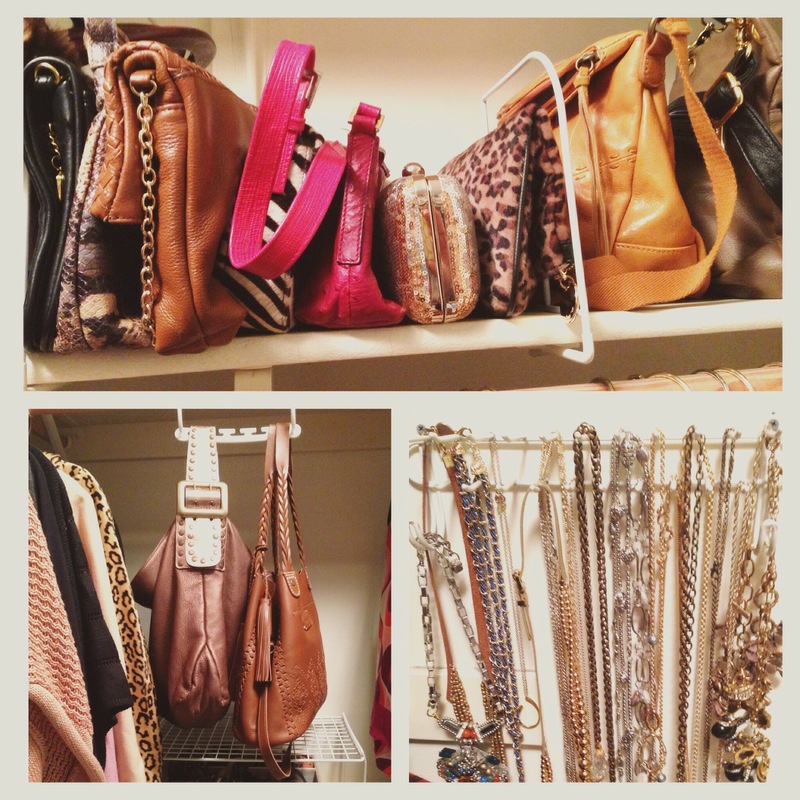 Poshmark does take a small fee, but for all they do – it’s well worth it. You simply list your item using the App. Once it sells, Poshmark sends you an email with a prepaid shipping label (part of the service fee they take, once your item sells), you attach it to a Priority Mail Box (which can be delivered to your home for free), and off it goes- they take it from there. I honestly got tired of dealing with fussy buyers on Ebay – so this option, is one I love. Get $10.00 off your first purchase by typing my share code “JICFU”, when you down load the app. 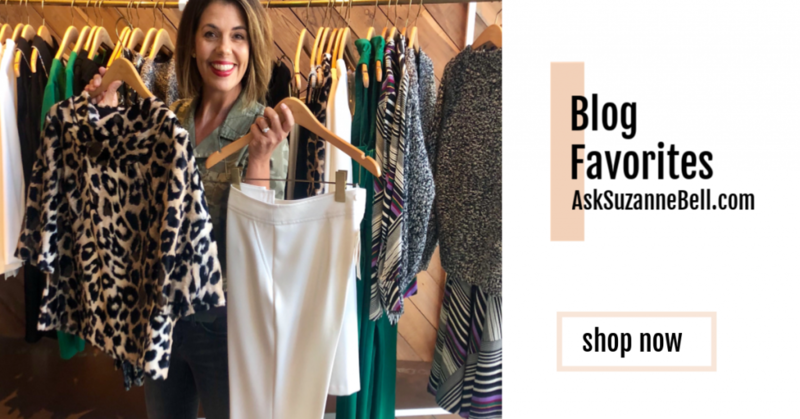 Designing from my Closet blog, recently wrote a very informative post titled, “Tips for Selling on Poshmark”, if you want to learn more. Paint your closet a soft pretty color. Over-the-door shoe racks are a great way of saving space compared to on-ground shoe racks. 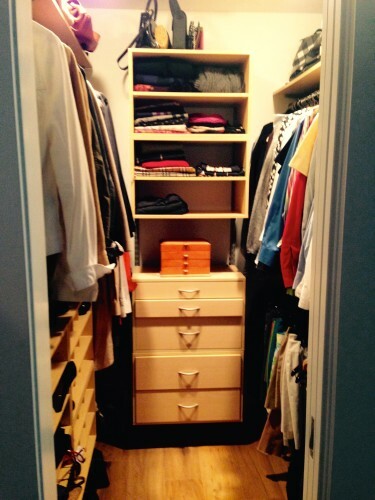 If you have some space in your closet, perhaps put a dresser in the closet and store your folded items in it. I like to keep one basket in my closet for extra hangers. I have a second basket for slippers and flip flops to giving me easy access to items I wear daily. A new closet! Everything has been touched and inspected, ready for a new season! How do you approach your closet? Do you have a strategy that works for you? Let’s hear about it! Do you find the task overwhelming? Thought and comments down below, do scroll down and share!